When I eat poultry, I love having it with some sort of fruit sauce or chutney. A slice of turkey and cranberry sauce with whole berries; duck with blueberry chutney; chicken with cherry port sauce. I find the fruit sauces to be a delightful addition of flavor, moistness, and texture. In fact, I would far rather have a fruit sauce than gravy. With cherries in season, they seemed like a good ingredient to try in a sauce. Being freshly picked, they are fairly sweet, just enough to balance the seesaw of sweet and savory in this sauce. Sautéed onions fill the other side of that equation. Simmered in port for a little bit and then allowed to chill in the refrigerator, this recipe is a great summer replacement for cranberry sauce. In addition to be served on poultry, it would make a nice complement to a cheese tray. If you’re wondering what is the easiest way to pit cherries, I have a slightly messy, but handy, trick. First, put on an apron. Second, place the cherries on a large cutting board that is on a cleared counter. Third, hold a carving knife with the side of its blade resting on a cherry; with the other hand hit the side of the blade. The pit will be loosened significantly, making it quite easy to remove. 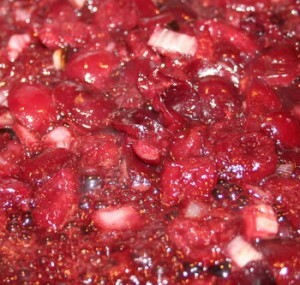 However, you will have cherry juice all over the cutting board and surrounding area. You also could use a cherry pitter, but I have found them to be tedious. Place onions in a nonstick frying pan over medium heat. Cook for 5 minutes, or until tender. While onions are cooking, coarsely chop cherries. Add cherries to frying pan and cook for 30 seconds. Add port, sugar, and cinnamon, stirring to combine. Allow to simmer for 5-10 minutes or until sauce thickens slightly. *This sauce can be served warm, if preferred.